This pack of ready to use SMARTboard files can be used as a self checking math station during your math rotations. The files are grouped so that you can open the working number the math group needs to work with. 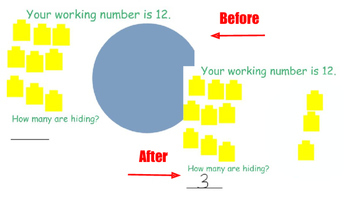 You will receive 10 SMART Notebook files, one file each for working numbers 3-12. Each file includes all possible combinations for that working number. 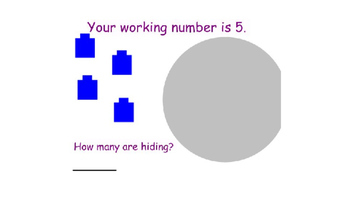 Cubes are shown and the student must write how many are hiding behind the circle. 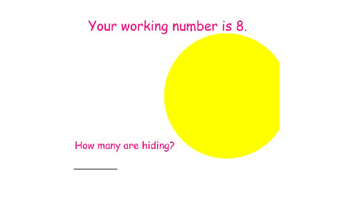 Once a student has written his/her answer, s/he may click the circle to make it disappear and reveal the hiding cubes. Make sure to check out my One More Task for a SMARTBoard Math Station! It includes numbers from 1 all the way to 110! The first two sets (numbers 1-22) include cubes with counting practice embedded in the station as well.